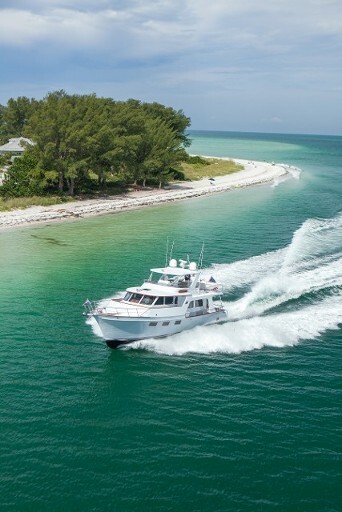 Marlow Yachts announced at the October 2013 Ft. Lauderdale International Boat Show that it had begun construction on a new model, the ME 49 E. We listened to our customers who have expressed a great interest in a yacht in this size range. The plans were unveiled as a complete surprise to all at our lavish owners party and we quickly received orders from our very excited customers. This yacht was introduced in Miami 2015. We have now delivered over 20 of this model alone to extremely happy Marlow owners. Like all Marlow yachts, this ME49 E features our unrivaled construction techniques with the finest of materials. It exhibits the same grace, dexterity and reliability in performance and provide the quiet luxury, overstated volume and outstanding fit and fiinish that all Marlow yachts share. She is constructed with our third generation radius transom, thus providing a significant gain in lazarette storage and cockpit areas. There are several options for stateroom configurations creating either two very large staterooms or adding a third with twin bunks for very comfortable accommodations. 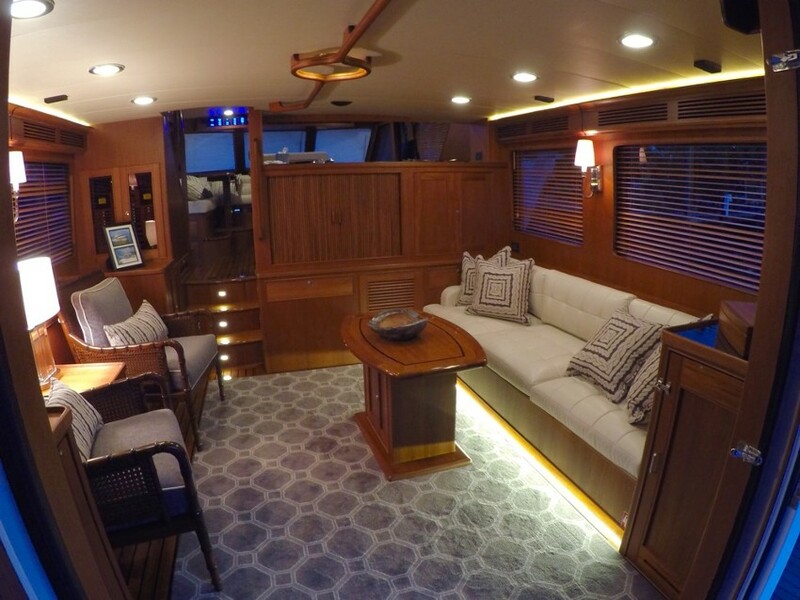 The layout of the this model is similar to all the Marlow Explorers with entry into the salon from a large aft deck equipped with a settee for entertaining and lounging. The salon has a starboard side sofa with twin arm chairs on the port side. The entertainment center is hidden behind tambour cabinet doors providing an elegant expanse of teak cabinetry and beautiful furniture. 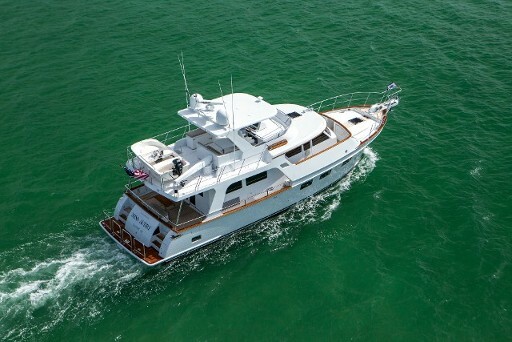 Up three steps into the pilothouse is the ample galley on the starboard and a comfortable dinette on the port side forward. The command center for the captain who would like to run the boat from inside has all the vital instruments perfectly arranged. The fly bridge is large and comfortable for the captain and all those sharing the cruise. 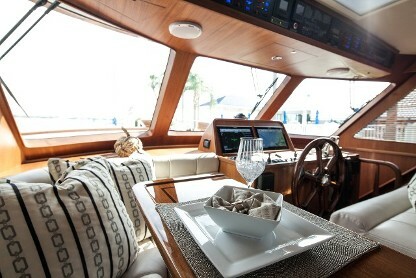 A dining table with settee, a grill and refrigeration makes for a wonderful entertainment area at dock or anchor and also convenient while at sea. The master stateroom is large with a wall of cedar-lined hanging lockers and storage, a chest of drawers, beveled mirrors and a bright and roomy master head. A step down toward the aft is a unique passageway to the engine room. 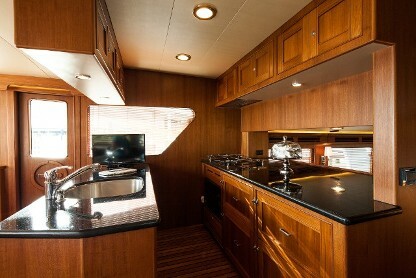 This provides space for the washer and dryer, a freezer and lots of storage in beautiful teak cabinetry while giving passage into the engine room through a water tight door from the interior of the yacht. There is engine room access through9i the transom door while at dock or anchor. The deveopment and design of the Marlow Explorer 49 took over four years. Having built larger yachts first and wanting to have all those features and quality in a smaller yacht presented a lot to think about. You cannot afford to miss any detail. We feel we have hit the mark with our ME 49 and steady demand proves our Marlow owners think so as well. With its sturdy build, proven seaworthiness, redundant systems and enormous capability to travel, the ME 49 will be seen in ports around the world.